‘A leaf-blown shimmer of a voice’ is how The Independent described Nynke Laverman’s voice. In her music, melancholy, poetry and the Frisian language come together in a completely unique sound. Her travels to Portugal, Mexico, Cuba, Spain, and Mongolia have left their traces in her musical style. She immediately made a name for herself with her debut in 2003, introducing the ‘Frisian fado’ to the world. The album earned her both a gold disc and a literary prize. 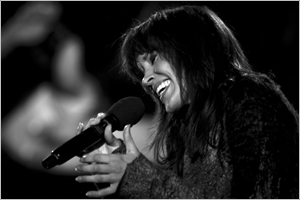 Her third album ‘Nomade’, written on the steppes of Mongolia, was rewarded with an Edison (the Dutch Music Awards). In 2012 her vocal talents attracted the attention of the famous Spanish producer Javier Limón. He produced her fourth album ‘Alter’, which was her breakthrough to the international stage. It was released worldwide and critically acclaimed by the international press. Her latest program ‘Wachter’ will go into revival this fall. Sytze Pruiksma is a composer, sound artist and bird watcher. He combines his love for birds and landscape with music and film, giving voice to the landscape he cares about. 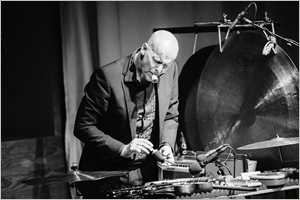 He was educated as a classical percussionist but quickly developed his own specific way of playing, characterized by a great attention for timbre. He performed his first landscape symphony LÂN in 2008 in the Netherlands and in New York City. The successor, his own version of the classic story ‘Conference of the Birds’ with a thousand brass musicians, will premiere in July. With professor Theunis Piersma he performs all over the world, giving musical lectures on global bird migration. Since 2003 he works with Nynke Laverman, and he contributed to the last album of Nils Frahm. He is engaged with LF2018 as the artistic director of ‘King of the Meadows’, and he composed the music for the official Opening.